The Data Logging Rain Gauge is a battery-powered rainfall data collection and recording system which includes a HOBO® Pendant Event data logger integrated into a tipping-bucket rain gauge. 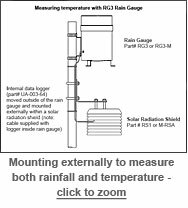 This model automatically records up to 160 inches of rainfall data that can be used to determine rainfall rates, times and duration. Also records temperature when used with an optional solar radiation shield (RS1 Solar Radiation Shield, or M-RSA). Base station or shuttle is required. 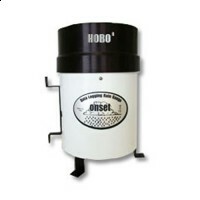 High quality tipping-bucket rain gauge includes a HOBO Pendant Event data logger. Base station or shuttle is required. Time accuracy: ± 1 minute per month at 25°C (77°F), see Plot B on page 10. Accuracy: ± 0.47°C at 25°C (± 0.85°F at 77°F). A solar radiation shield is required for accurate temperature measurements in sunlight. Resolution: 0.10°C at 25°C (0.18°F at 77°F), see Plot A on page 10.